The Sounders’ MLS opener was caught between international matches, so a half-varsity lineup was not enough to prevail against even an expansion team. For those who weren’t playing attention, the MLS had its annual day off a while back. Nevertheless, it’s easy to tell the new season is here: The Sounders are dorking around. Knowing they were stuck playing three games in six days, they ran out a bit of an exhibition-game lineup Sunday afternoon that helped give an expansion franchise a first-game win at a place where road teams go to die. Eight months from now, when the playoffs begin, if the Sounders are involved, few will remember losing in March to newbie Los Angeles FC 1-0. Although the 40,070 at the Clink who sat through a downpour that included hail, thunder and lightning may recall wondering whether waddling about in wet underwear was worth it. But the international soccer calendar says it’s CONCACAF Champions League time, a tournament the Sounders take seriously. So in addition to the injury absence of Jordan Morris, the Sounders gave the day off to two 34-year-old mainstays, Clint Dempsey and Chad Marshall, rested injured Victor Rodriguez and Ozzie Alonso, and played Roman Torres and Magnus Wolf Eikrem a half each. Most will play Wednesday in the first leg of a quarterfinal matchup with Chivas Guadalajara at the Clink, after the Sounders prevailed in two matches over a team from El Salvador to advance. 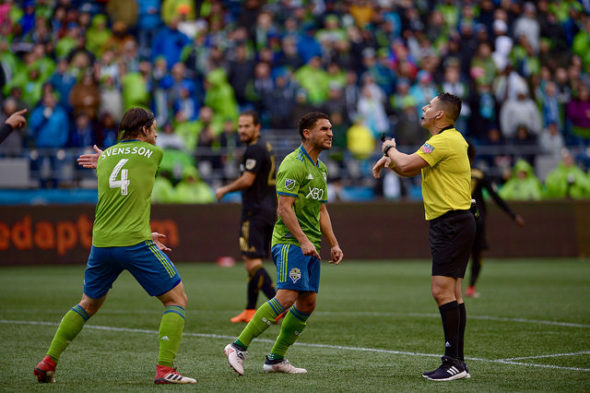 But because key players were held out Sunday, the Sounders could outshoot LA 22-5 and have a 12-1 advantage in corners and still not finish off a team that had no business winning their first game at the home of the defending Western Conference champions. Asked for positives from the game, coach Brian Schmetzer paused for several pregnant seconds. “I really don’t feel like there’s a ton of them,” Schmetzer finally said, diplomatically. He said they tried hard, as if the feat were something beyond the minimum requirement for professional athletes in any sport. Because international play always holds sway in soccer, to complain about it would be seen as boorish. That doesn’t mean coaches and players aren’t conflicted. Sounders midfielder Cristian Roldan explained that if he had his druthers, he’d like to keep to the MLS schedule. “Obviously we want to get results at home for our fans; they deserve it,” he said. “If we can continue to be involved with CONCACAF, it’s fantastic for our team. Our goal is to continue as far as we can and hope we can win it. But absent Morris and Dempsey, the Sounders lacked the premier finisher to exploit their dominance in the run of play. Schmetzer was asked whether keeping Dempsey on the bench to be a late sub was considered pre-game. So once a defensive breakdown in the 11th minute gave LA forward Diego Rossi a straight-on clear shot that he converted easily, the Sounders chased futilely the mistake for the rest of the afternoon as LA packed the bunker. Hero of the game was LA goalie Tyler Miller, a three-year Sounder who was Stefan Frei’s backup before being taken in the expansion draft. He had seven saves in his return to the Clink. The pressure on him was fierce. “There was a ton of chances created,” Schmetzer said. “It wasn’t from a lack of execution. It was from a lack of a last piece of concentration to put the ball in the met, and some unlucky bounces. The same thing might be said of MLS competition in the middle of an international tournament. An earlier version of the column misidentified Sounders coach Brian Schmetzer. Thanks for the great story …just a couple hours after the game. I believe the Sounders should focus mostly on the MLS matches also. Great comments from Rodon. I do understand the importance of CONCACAF. It began in 1962 and MLS in 1996, and is a big deal is growing the Sounders brand in North America and around the world. But as long as the MLS calendar is different than the rest of the world, gears will be ground up regarding scheduling. It’s too bad for newbie fans used to the US custom of league-first. League first is not a bad idea. I think the Sounders brand can get a bigger boost winning the league ( home game for finals could come down to one or two games ) and they can use it as a bigger draw in other tournaments. I don’t remember any teams in the NASL playing tournaments. Then again the league was mocked like the MLS is in Europe. I am not a new Sounders fan …. but I believe in winning your league by using your top players and playing younger fresher for other conquests. It is a way to keep your guys you are developing sharp. Who is this Schneider you speak of? I think the Sounders have their priorities straight. The quarter finals of CONCACAF are more important than the first game of the MLS season; there are 33 others waiting to be played. Chances are we wouldn’t be having this conversation if the Sounders were fully healthy anyway. All leagues play in multiple overlapping tournaments. That’s just the way of football. MLS is just starting to loosen up the pursestrings that enable teams to field enough elite players to be able to fight for multiple results. If Sounders make a good showing, it helps elevate the entire league.